These beautifully printed personalised baby blankets are the perfect gift for newborns, Christenings and 1st birthdays. Made from soft, snuggly double thick 570 gsm Polar fleece fabric, it feels a dream against the skin and keeps baby nice and snug. Print your photos, a special message or other designs for a truly bespoke blanket that doubles as a sentimental keepsake for years to come. 100% satisfaction guarantee or you'll get your money back. Soft and cuddly personalised baby blankets keep your little one warm whilst wrapped up in special photos and messages. Take advantage of the double-sided printing and feature a photo on one side and a message on the other, or choose from four pastel colours for the reverse. The blanket is available in four sizes, however, the 'small' and 'small square' sizes are perfectly suited for babies. The water repellent qualities of polar fleece lend themselves well to making baby blankets, as inevitable dribble can simply be wiped off. Enjoy creating something totally unique that will bring comfort to both baby and parents. With our 13+ years of experience, we can guarantee high quality, super soft, baby blankets. This was a present for my mum on her Golden Wedding Anniversary. She is confined to a chair and uses a wheelchair so we thought a blanket to keep her toes warm with photos of the family was a perfect gift. The blanket arrived very quickly, is lovely and warm and the photos are excellent. I would strongly recommend this company for not only an excellent product/service but also great customer service. A perfect gift, thank you so much. I have used Bags of Love twice now for special purchases when my great niece and nephew reached their first birthdays. I bought the photo collage blanket. They are amazing and a wonderful keepsake. Great price too. The service is first class and quick. I will definitely recommend and return again. Many thanks!! I purchased 3 of the medium size blankets for family members and they were overwhelmed with the superb quality of the photos and material. They were despatched quickly and arrived in perfect condition. The process was smooth from start to finish. I could not recommended this company enough! 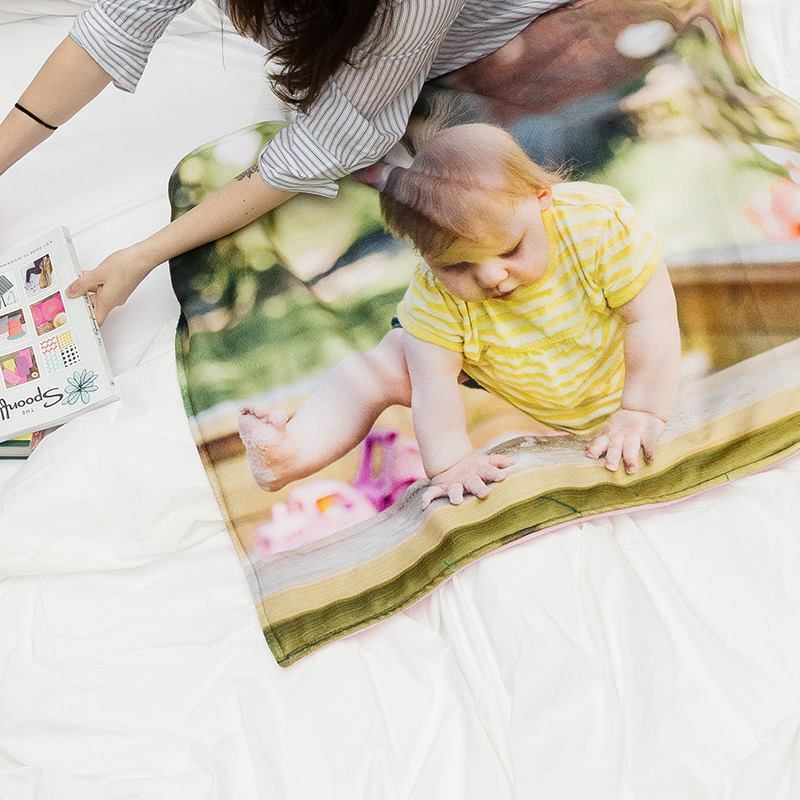 Great product, clear photos, good quality blanket and fast delivery. Care: We recommend to wash your baby blanket at 30°c, drip dry flat or tumble dry on low heat. Do not wring out. The print is design to be long-lasting even with washing and daily use, so it's a durable, practical gift. We use a polar fleece that is anti-pilling, meaning it won't bobble over time and lose that softness. Ironing isn't required. We provide a 10-year money back guarantee on print, material and stitching finish. There's a three for two offer on our baby blankets, so design each one individually or apply three of the same design to the basket and the discount will automatically deduct. Expert seamstresses hand stitch your blankets to order in our London, UK, facility. Your designs are printed using a specialist process that fuses the inks deep into the fibres of the fleece fabric, creating a long-lasting print that is fade-resistant. Images and details are sharp, with a high definition photo finish. Two layers of fleece are hand stitched together, to provide your baby with extra warmth and comfort. Choose from either soft pink, baby blue, cream or black for the reverse or, alternatively, we can print your photos and text on both sides. We expertly print your images onto the surface of the blanket, and you can add text to display their name, date of the Christening or birth. This non-embroidered blanket for babies features an exquisite print reproduction for that ultimate HD finish. To incorporate an element of tradition to your blanket, you can upload an image of embroidery style text, to give it a classic aesthetic, or choose one of our more elegant fonts in the design interface. This personalised baby blanket would make a brilliant christening blanket. Design a special keepsake blanket for a baby's Christening, printed with their photo, name and date of the ceremony. It can be worn during the blessing, keeping the little one comforted throughout the process. Commemorate a milestone birthday with a beautifully bespoke 1st birthday blanket. Filled with pictures from their first year on Earth, it serves as a treasured keepsake to reminisce over in years to come. To create a montage, upload several pictures, select all and then choose a collage pattern or arrange manually. A cute design idea is to print out the lyrics to their favourite nursery rhyme. When you're on the move, it can help comfort them in times of distress, or a welcome distraction on car journeys. Include illustrations of farm animals or other icons for a fun travel blankie and a nursery rhyme blanket all in one.